Generally, I will eat just about anything before I turn my nose up at it. That excludes Turkish puddings. I hate to say it, but I’m not a big fan. It’s a texture thing. I find most of the Turkish puddings to be chalky or starchy. They simply don't taste silky smooth compared to a bowl of freshly made French custard. (Note: I also don’t like shrimp because of the texture thing, but I will eat raw oysters. Odd. I know.) I’ve tried them and just don't like them. So I have avoided the infamous Turkish puddings. In Istanbul, there are dozens of shops called Muhallebici (translated directly as a dairy bar) that sell a variety of puddings. On a recent outing with Claudia of A Seasonal Cook in Turkey in Istanbul, I tried an extra special type of pudding called tavuk gögsü kazandibi (chicken breast pudding). Grab a spoon and dive right into this special Ottoman-era pudding in Istanbul! Yes, this special pudding, dating back to the Ottoman period and served to Sultans at Topkapı Palace, is made from shredded chicken breast. 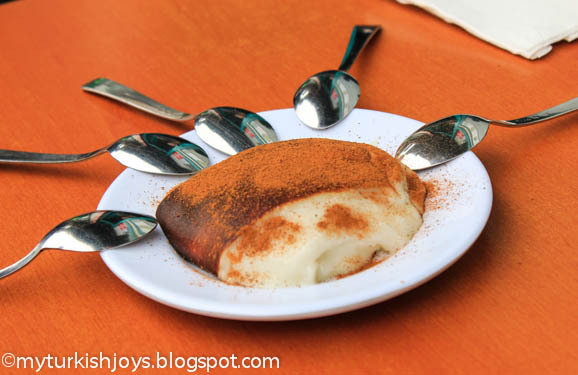 It’s a milky, sweet pudding that is enriched with cinnamon. The chicken is boiled, shredded and ground into a sort of paste. Then the pudding is slowly cooked in a pot until the natural sugars caramelize on the bottom, hence the Turkish phrase kazandibi, which means “bottom of a pot.” You’ll notice the brown “burnt” coloring in my photo. In my opinion, I think you’ll find the best tavuk gögsü kazandibi at Kısmet Muhallebicisi in Eminönü where Claudia took us. This tiny mom and pop shop also is part of the Istanbul Eats Culinary Walks. I swear you would never even know the pudding contains chicken! And this pudding is smooth and NOT chalky like most! I may be a Turkish pudding convert. I'm with you on the Turkish pudding front. I'm fine with the texture; anyone who had 13 years of UK school dinners is used to that. It's the sugar content. Far too sweet for me. 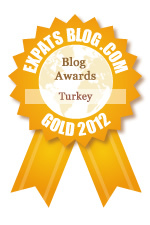 ooooohhh and I love the turkish puddings because I love their texture! :))) I am more of a fan of the dairy puddings rather than the sherbet ones. @Edibe, How funny! I guess you either like Turkish puddings or you don't. i eat just about anything too. but puddings push my texture (mouth feel) button! @Ozlem, grab some Turkish pudding while you can!